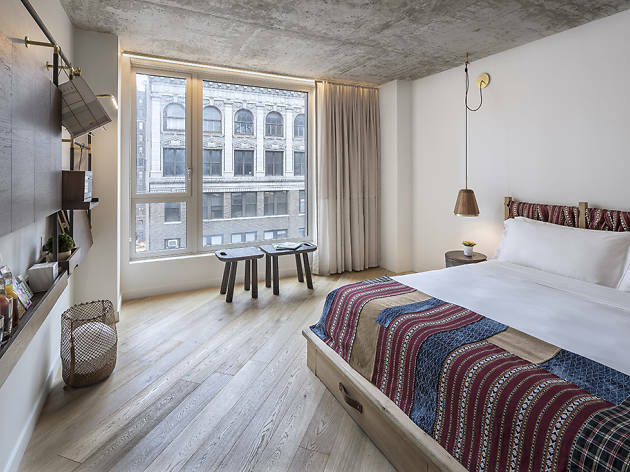 Smack dab in the middle of the sliver on 29th Street between Broadway and Sixth Avenue sits the boutique hotel, MADE, one of the newer additions to Nomad’s ever-burgeoning hotel scene. 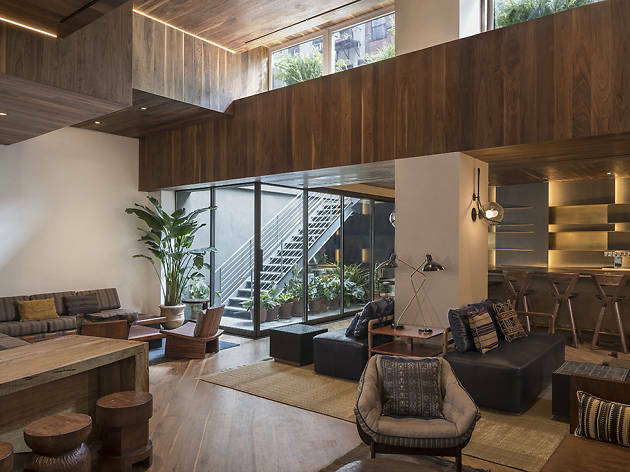 From the outside it’s quite unassuming—a thin building with stained wood paneling on the facade; a smooth, gray exterior with wooden-framed windows stretching 18 stories into the sky. 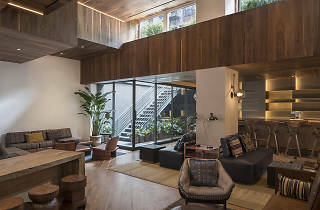 When you enter the hotel you’ll find Paper, the hotel’s coffee bar that also serves espresso drinks and pastries with a large communal table set in the front of the counter area. 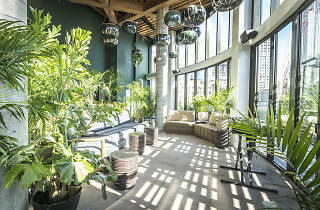 In the back of the lobby of woods and white walls, there’s a quaint full-service bar with a stairway that leads outside to a private guests-only patio which is perfect for a cocktail upon arrival. 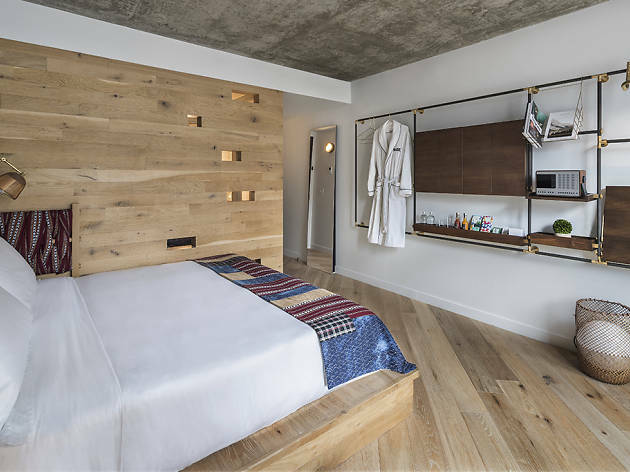 For a narrow hotel, the design of the street-level commonspace gives it an open feel for some serious relaxation. 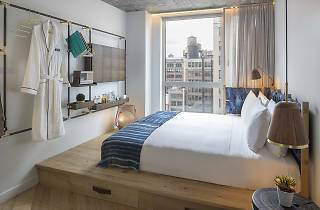 A hotel for just the business traveler or only the quick weekender it is not—MADE is high on charm and the stylish decor of the rooms speaks volumes of the hotel’s knack for thinking modernity with every touch. 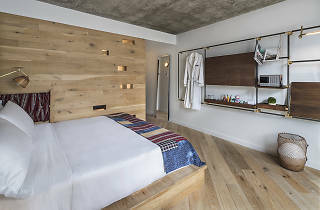 The 108 guest rooms offer floor-to-ceiling windows and are dressed in brown woods and whites with exposed concrete ceilings; beds are set on wood platforms and thin, entertainment centers made of metal bars are fastened on the walls. 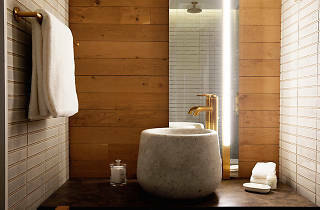 With Samsung flat screens, REVO Super Connect radios and Davines bath products in each bathroom rounding out the room amenities, their simplistic approach to design gives each room a bright finish. 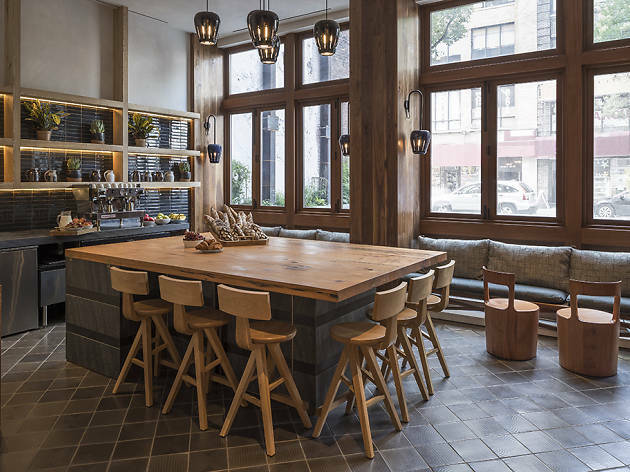 For places to congregate as a group or get cozy with your significant other, MADE is full of areas to get your mingle on. 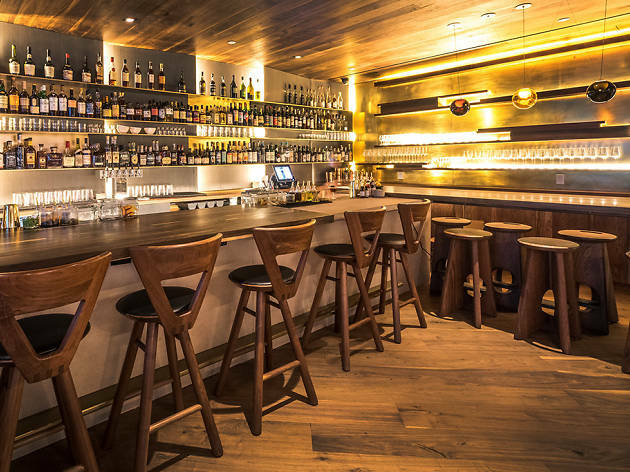 In addition to the private patio and Paper coffee bar, the lobby bar has a daily dining menu from 11am to midnight. 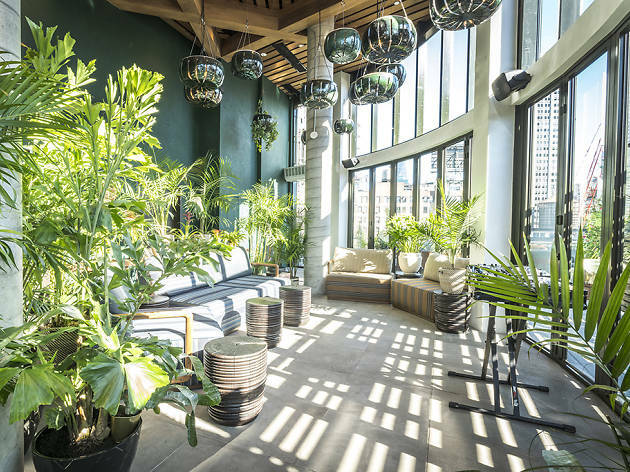 There’s also Good Behavior, a lounge on the 18th floor open year-round with indoor/outdoor seating and fantastic views of the Empire State Building. 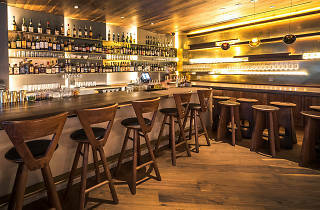 The lounge serves up Tiki-inspired cocktails, craft beers and large format cocktails for sharing. 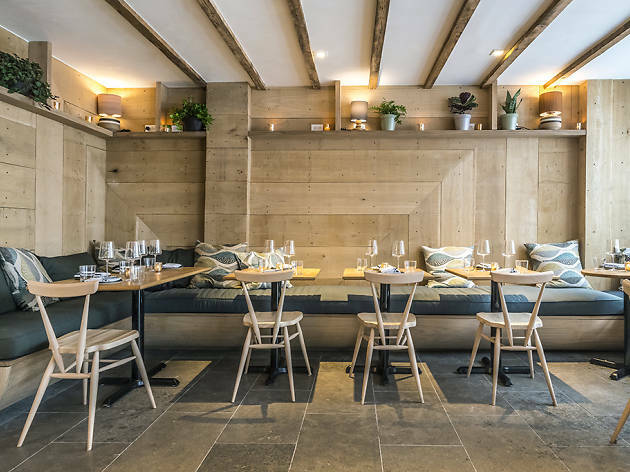 But the real centerpiece to the dining experience is Ferris, the 40-seat seasonal New American restaurant set beneath the hotel from Le Turtle vet Greg Proechel. 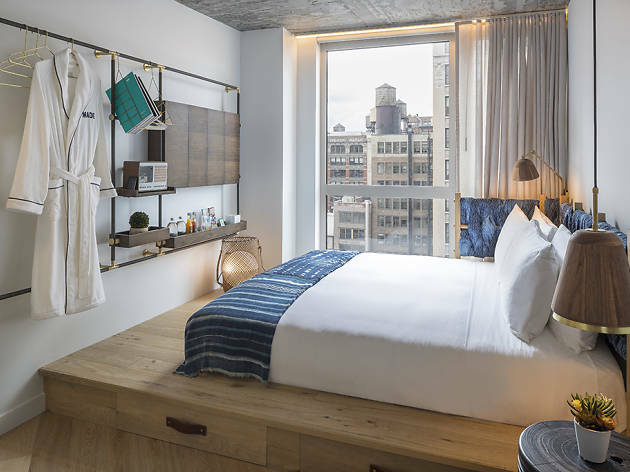 MADE is right around the corner from the N,R,W subways at 28th Street and Broadway and there’s also a 1 train on 28th and Seventh Avenue. You can also grab the Path at Sixth Avenue and Herald Square along with the B,D,F,M trains; Penn Station (LIRR; 1,2,3,A,B,C,E) is extremely close as well. 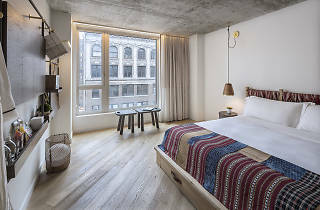 Local attractions include the Flatiron building and Madison Square Park, and for the walking warriors, Bryant Park is 11 blocks north. TIMEOUT TIP: In the mood for a killer beer and some grub? 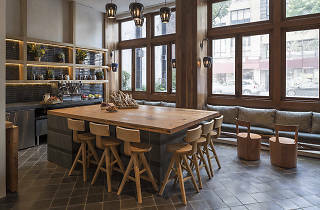 Just a few blocks west on 29th between Seventh and Eighth Avenues is Haymaker Bar and Kitchen with a lengthy craft beer list and 18 taps selected by a former Berg’n suds slinger. The brew is constantly rotating and you’ll always find local gems like the Interboro double dry hopped “Real Love” double IPA with an apricot nose, or a Threes Brewing “Logical Conclusion” IPA with notes of peach. Pair the beer with their house-made mac n’ cheese made with a four-cheese sauce, green chilies, and garlic bread crumbs. 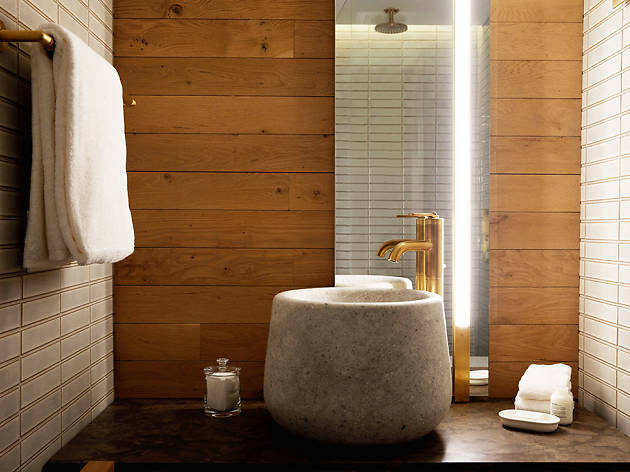 Sit there all day, we won’t judge. 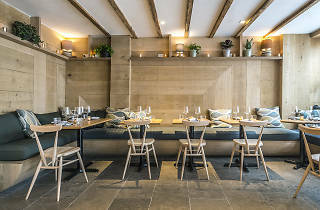 Just save us a seat.